spring to me is synonymous with leather jacket weather; that perfect balance of chilly sunshine and later-afternoon warmth. 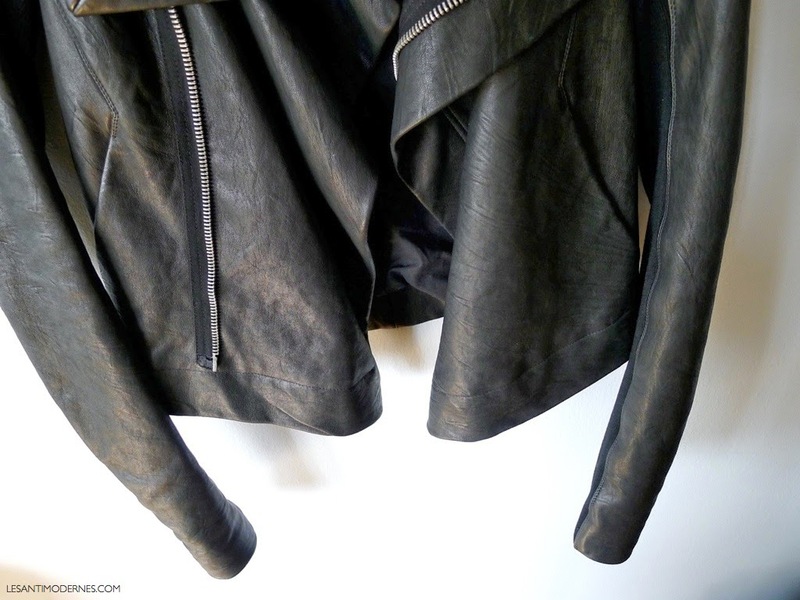 i recently got a dream foundation piece: the Rick Owens classic leather jacket. for those of you who are also considering this piece, here is my review – hope it's helpful! the fit: the sizing definitely runs a bit small (particularly in the shoulder/through the arms, where the jacket is most form-fitting). i'm usually a 0-2/XS (sometimes a S) in most designer sizing, and i'm wearing an IT 40. i tried on the 38 as well, but it was a bit too tight for my liking in the shoulder and body. the 38 might have stretched out a bit after breaking in, but i prefer the 40 as a more comfortable yet still form-fitting size. the look: a seasonless classic in my book. i'm generally not a head-to-toe RO kind of person. that said, i find his leather jackets to be incredibly easy to incorporate into a variety of wardrobes and styles. they manage to be both iconic and low-key. many Rick fans collect his leather jackets, and it's easy to see why. worth it? yes – if you love leather jackets and wear them as a foundation season after season (as i do), this is a worthy splurge. it really depends on your lifestyle, budget, and wardrobe priorities. since my spring wardrobe planning post, i've been living in my ryan tanks (thinking of getting a few more in the S for a bit more slouch factor) and Yohji-esque H&M sweatpants. both pieces are easily the best basics i've bought this season, and i wore them all through my Japan trip. **as an alternative to the RO, i also love these similarly luxe versions by Veda and Vince (currently on sale). do you have any Rick Owens pieces? what are you feeling for spring? Love this look! Sadly the Vince version is sold out in my size - I was going to get it as I liked the slightly more shrunken fit for my petite frame! I'll have to save up for one of the other versions :) In the meantime, a question about the H+M sweatpants: Do you think the Small seems roughly equivalent to a U.S. size 2? That's what I usually wear in standard pants brands like J. Crew for instance. I've just had terrible luck with the sizing on the H+M sweats and would love to get these but am a little scared off by my bad luck so far! Thanks! i'd say the S is ~ to a 2-4, as it's designed as a slouchier fit with somewhat harem-pant proportions. hope that helps! The fit of the jacket is great on you. How is the cushioning on the Air Max Theas (specifically around the arch?) I like the look of the Frees but have been wondering about the Theas. I have the Frees and love them, and I am VERY picky about the fit and comfort of sneakers. I have a pretty narrow heel and wider forefoot and find that most sneakers fit like a box on my foot. But the Frees are great. I got them after reading this blog, and after having nixed and sent back maybe ten pairs of sneaks that just didn't fit right. Have not tried the Theas, but definitely highly recommend the Frees. I had to go up a whole size in them, though, just FYI. Normally a 7.5 and took 8.5 in these -- they def run SMALL. @Shutterbug- definitely agree with Aurora on the frees - they run a full size small. i sized up by half on the Theas as well. love them both! I have wanted a RO jacket for ages but the arms being tight is a problem for me (I have large shoulders).. and I find the lapels too wide (again, wide shoulders made to look wider with wide lapels). I have wanted a RO jacket for so long but the tight arms make me hesitate and the wide lapels would make my shoulders look even larger (I'm an inverted triangle). I have my eye on a similar style however, but with smaller lapels.. or a moto jacket style. I am in the same boat! Saved for an RO jacket last fall, tried on dozens and couldn't find a single one that fit my shoulders. For reference, I am a US so 4-6 and even the 44 was laughable. So disappointing. Then I accidentally stumbled on a Helmut Lang leather jacket, similar hooded and slouchy style but with no knit panels. It fits perfectly and I have worn it nearly nonstop since then, but it's getting too warm outside now. I recently purchased a pair of RO skinny jeans from a consignment store. I confess I only tried them on due to the designer name. To my surprise was they weren't too long! I'm 5'3" and a bit long-waisted. But I think I love them! However, I'm limited to a consignment store designer budget. beautiful, life long piece! goes to prove that classic pieces don't always have to be those "basics." i have RO drkshdw hoodie and a mainline coat. And as you said, RO runs small, and tight esp under the arms, I'm a skeleton and I can I wear a sz 40 in RO too. That jacket is a real classic and works with so much of one's wardrobe! Nice choice. Fantastic! You look comfy and cool as if its been a part of your wardrobe for years. I've been interested in slightly oversized leather jackets lately but this looks like a dream. Congrats! Congratulations on the addition to your closet. It looks fabulous on you. Definitely a classic that you'll wear for year. I've been wanting one for years, but I'm also tempted by the Acne Mape. I only have the Rick Owens ankle wedges, which I love. They are so comfortable and go with absolutely everything. thanks mel :) i've also admired the RO shoes as they go on sale now and then, good to know that they're comfy! i find the mainstream adoption of the signature RO 'look' so interesting. it's a very versatile aesthetic, no? Beautiful! I love that RO has his "basics" every season. Gives you time to really think a purchase through rather than worrying that it will be gone next season, not to mention gives you the time to save up :) I'm sure it will only get better with age. thanks koko :) i've long admired your RO pieces on your blog! i bought my RO moto jacket last year as a special present for myself for a BIG birthday and i love it. the leather is noticeably special & the cut is- as you say perfectly - sculptural. i have wide shoulders so i have a size 44. i don't think having wide shoulders necessarily closes out RO as a choice - it depends on the hips. my hips are narrow so i think the look is "balanced." also, when the jacket is worn open - as in the pic above and as i most often wear it - it doesn't emphasize the shoulder line so much. i also agree that the RO look is very mainstream now. those lapels, the side panels, the ribbing - it's everywhere. b/c of this i thought long& hard whether this would look dated in a few years. but when i tried it on - i hate to resort to cliches- it looked timeless. i have a little bit of an RO obsession going now. so much to obsess over - his furniture! his girlfriend- michelle lamy! also- a few weeks ago the NYT mag had an article about the designer of RO's london store- jacques dirand i think. he said he only wears RO jackets & he has 50 of them. (also- i 'm contemplating a utility/military jacket - would love to hear more about your rag& bone). congrats on your RO jacket. i love that it's such a personal purchase. i love how grounded Rick comes off in interviews. and Michelle Lamy is fiiiierrrrrce. Congratulations on your purchase (slightly late, I'm sure you've been enjoying it to no end)! An extremely versatile piece, love the leather you've chosen. Rick Owens leather has always been a favourite, and unfortunately for my bank account, an addiction. The collecting will never end!